In the early twentieth century, life was hard for Jews in Romania. They were denied citizenship; they could not be lawyers, teachers, chemists, or stockbrokers, nor could they trade important commodities. In 1902, when my father, Sam, was eight years old, his father, Avrom, took him to register for school in Tecuci, their small Romanian town. So Avrom and his family left Tecuci and came to America. They were among the millions of Jews from central Europe who arrived at that time. Many settled in crowded cities where living conditions were considered unhealthy. A European Jewish philanthropist became concerned, and created a charitable fund to settle such immigrant families as farmers in presumably healthier, rural environments. Half a dozen Jewish families, including my father’s, were settled in Arpin, a village in Wisconsin. Educational opportunities were limited, so my father left home in 1909 at the age of 15 for Cleveland, where he moved in with cousins. He hawked newspapers on the street to pay for his room and board, and he attended public high school. Cleveland was about as different from Arpin as could be imagined: more than half a million people, streetcars and automobiles, buildings 15 stories high, a professional baseball team with its own stadium, and a progressive school system that included a program in which homeroom teachers counseled students individually. 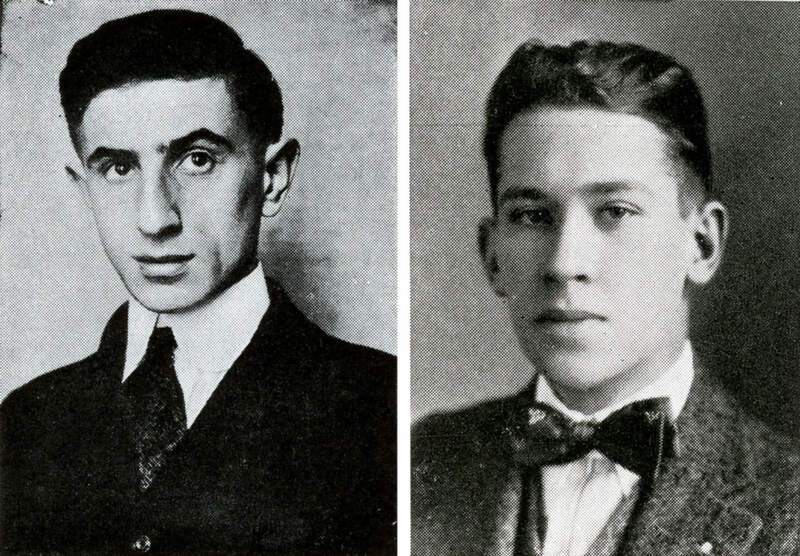 In 1912, one of his teachers, perhaps his home-room counselor, recognized some intellectual capacity in this scrawny immigrant Jewish kid and recommended that he apply to Harvard. He applied, Harvard accepted him for the class of 1916, and he went. In 1952, I was a Harvard freshman, knowing exactly one of my 1,200 classmates. I lived in Weld Hall in the Yard, which is also important to this story. My fifth-floor accommodations were spartan. The floor showed the wear of 80 years of freshman feet. The walls were old, tired, whitewashed plaster, and there was one relatively small window. I had a narrow bed with an iron frame, and one somewhat splintered wooden desk and chair. Lastly, there was a nineteenth-century fireplace. I had a rather nondescript freshman year but I did have one minor triumph. E.E. Cummings gave the Norton Lectures during that academic year, and I attended every one. Cummings skimped on the lecturing requirement, speaking for perhaps 20 minutes, and then filling up the time reading from his poetry. He had a wonderful reading voice, and I used to daydream that Cummings was my father so that he could read to me as I fell asleep at night. I was more than a little excited, and I invited several friends who had literary interests or aspirations. I borrowed a silver tea set and a white bearskin rug from the Boston Brahmin home of a classmate-friend, and we prepared, as best we could, for the visit. On the day, Cummings and his wife trudged up the five flights of stairs to my room, and arrived at the appointed time. The bearskin rug was on the floor and the tea set gleamed on our borrowed tablecloth. I made a fire in the fireplace for the first time, but when I lit the fire, I forgot to open the damper, with the result that I smoked up the entire room. We all, including the Cummingses, had to sit on the floor until I opened the damper and the windows and cleared out the smoke. For me, the follow-up to this social event was as important as the event. I came home for Christmas quite pleased with myself. “Well, Father,” I said, “I had tea in my room with E.E. Cummings.” And I sat back to wait for his response. That was my father—no clue about modern poetry, but a clear memory of a College classmate almost 40 years earlier. My friends and I did see the Cummingses one more time, and of course he did not remember my father. Now, 65 years later, I still have a clear memory of Cummings and his wife sitting on the only two chairs, and five earnest undergraduates sitting on the bearskin rug at their feet. I learned something about myself—what I could do if I tried, and something about my father—what was important to him, and what was not. James C. Beck ’56, M.D. ’63, is a professor of psychiatry at Harvard Medical School ([email protected]).